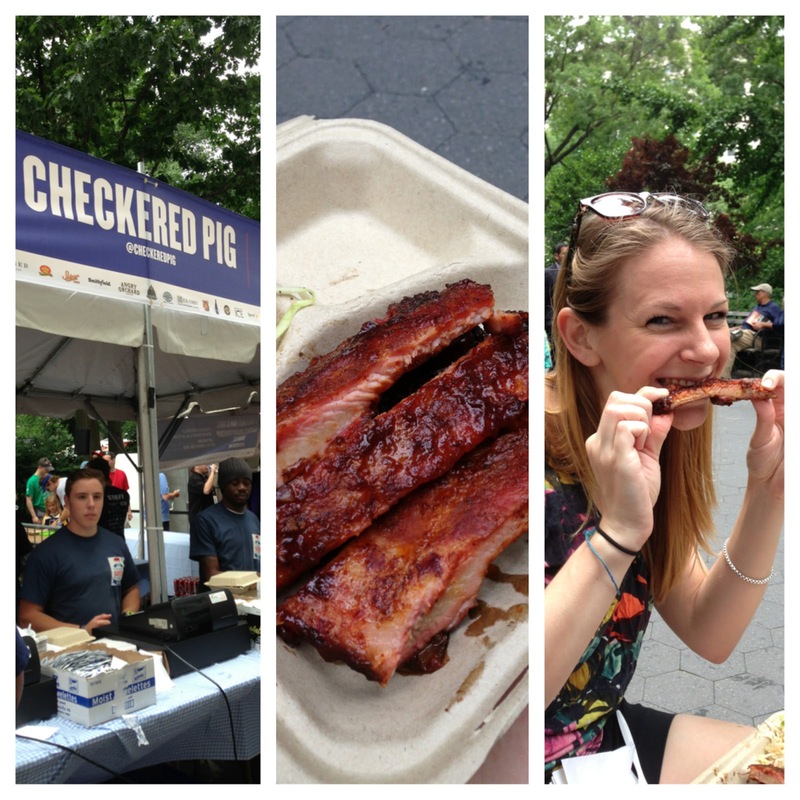 On Saturday, Kat and I visited the Big Apple Barbecue in Madison Square Park. If you recall, two years ago, I went to my first Big Apple Barbecue with Kat. In that post, I joke about it being a record that we were able to meet up twice in one week. I am proud to announce that Kat and I now hang out ALL THE TIME. It certainly helps that we live only a few blocks away and have a designated meeting spot whenever we have a play date. Split everything with a friend so you don't become full too quickly. I especially need to do this because my stomach gets overwhelmed sometimes and can't fit everything I want to fit into it. Our second meal, and my personal favorite of the day, was Checkered Pig's St. Louis-Style Ribs from Martinsville, Virginia. I really wanted to eat a full serving of these but I knew I wouldn't be able to handle it if I wanted to try anything else. When the lines start getting long, split up and go to two booths at once to save some time. I waited in the Salt Lick Bar-B-Q line (from Driftwood, Texas) for quite some time. I have been excited to try Salt Lick since twenty of my friends went to Austin and posted about it all week. The beef brisket and sausage plate was well worth the wait as I knew it would be. Eat another booth's offering while in line for your next. While I waited for The Salt Lick, Kat waited in line for Ed Mitchell, but finished up before me so we started to enjoy Ed's Whole Hog Pork sandwich. Skip the 'Slaw. This is easy for me to do since I don't like cabbage, but don't bother filling up on the coleslaw. For some reason, three of our meals had this as a side. We saw other items with sides of baked beans and one with pimento cheese and crackers but at that point we couldn't imagine having another meal. Tweet your brains out. Kat and I started tweeting about the BBQ and got retweeted a few times by the official BBQ account which inspired the Vlasic Pickle account to follow us. Their account is written as if from the point-of-view of their mascot, the giant Stork. Kat and I became obsessed with the stork and went back and forth a few times on Twitter with him to find him and take pictures. They also had free pickles there so it was definitely a win-win. When you can't eat another bite of meat and want some brewskis, head over to Shake Shack rather than the Shiner Beer Garden. Beers at the Beer Garden are $9 but only $5 at Shake Shack. Sarah joined us later in the day and was going to get ice cream and we realized this was the best way to get beer as well. 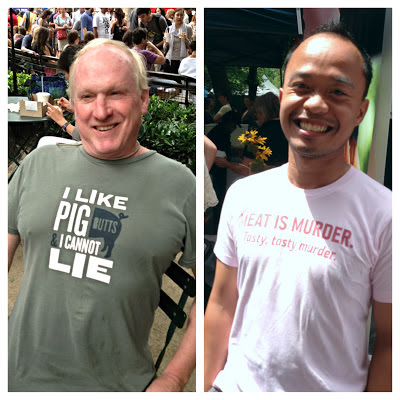 You can wait in the short line for the beers (and ice cream) but it still takes a while for the order to come out because even on a day with all this great barbeque available, Shake Shack is rightfully crowded. 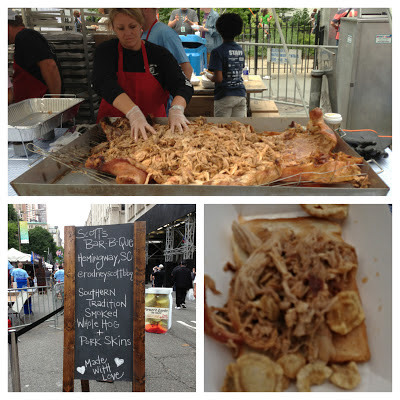 They also had a special during the event and put pulled-pork on top of their fries. If there had been any more room in my belly, forget about it. Grab a table at Shake Shack when one opens up, preferably next to someone one of you may have in your phone as "Jordan Subway" because you met on the Subway last fall. Awkwardly peer over to him and his date every four seconds. Make sure you're smiling and laughing so that if anyone recruiting for a reality tv show sees you and tries to sign your friends and you up for an upcoming series about 'finding your dream job in the big city'. Laugh when you see the age parameters of 21-27 and realize you are too old to find your dream job, even if your dream job is being on a reality tv show. Bring a NY Mag crossword puzzle to do in the sunshine with your pals. As if you'd ever leave home without one. Keep your eyes open for friends who may stop by (shoutout to Aub & Meg), coworkers and old classmates you'll undoubtedly run into, and even celebrity restauranteurs like Danny Meyer who was standing next to us at Shake Shack and was responsible for the whole weekend's event. Thank you, Danny. Cannot WAIT for next year's event. I'll begin training my belly now.